Wilfred Bion remains the most cited author in psychoanalytic literature after Sigmund Freud. His formulation of alpha function, waking dream thoughts, his theory of thinking and of the container/contained have proven seminal for the elaboration of psychoanalytic theory and practice, as well as the exploration of psychic functioning and the primordial mind. 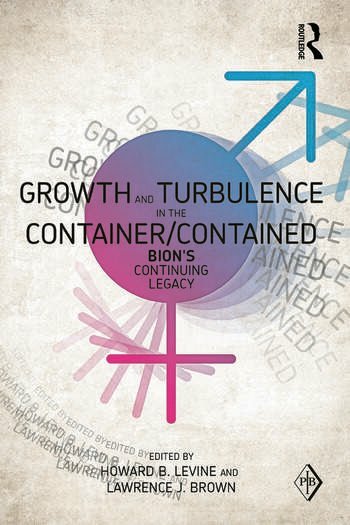 Growth and Turbulence in the Container/Contained　is　based on papers presented at the 2009 International Bion Conference held in Boston, Massachusetts. It represents the state of the art thinking of an outstanding international group of Bion scholars and experts. This book includes the most current trends in Bion scholarship, covering topics that range from the historical/biographical, to the clinical, the theoretical, the developmental, to the cultural and aesthetic. Proving a vital　stimulus to further creative explorations in the field,　Growth and Turbulence in the Container/Contained　will be of particular interest to psychoanalytic practitioners, graduate psychoanalysts, analytic candidates, psychoanalytic therapists, advanced therapy trainees,and scholars of all schools. Levine , Brown, Introduction and Historical Overview. Laks Eizerik, Introduction. Brown, The Development of Bion’s Concept of Container and Contained. Szykierski, The Traumatic Roots Of The Containment Fruit: The Evolution Of Bion’s Metapsychological Questions From Bearing Witness To Dreadful Answers. Aguayo, Wilfred Bion’s ‘Caesura’: From Public Lecture to Published Text—(1975-1977). Clinical Process. Ferro, Vicissitudes Of The Container-Contained And Field Theory. Grotstein, Dreaming As A "Curtain Of Illusion": Revisiting The "Royal Road" With Bion As Our Guide. Hartke, Psychological Turbulence In The Analytic Situation. Cassorla, Reflections On Non-Dreams-For-Two, Enactment And The Analyst’s Implicit Alpha-Function. Pathological States. Junqueira de Mattos, & Braga, Primitive Conscience: A Glimpse Of The Primordial Mind. Bruni, Container-Contained. Inverted Relationship. Weiss, Romantic Perversion – a Pathological Organization Based on –L. Reflections on Containment and the Experience of Time. Trachtenberg, Caesura, Denial and Envy. Infant and Child Analysis. Robinson, Infant Observation: Catastrophic Change Under a Microscope. Staehle, The Threatening Character of Change. An Approach With Patients Who Experience Progress As Trauma. Applied Studies. Waddell, Meaning And Form. The Containing Function Of Art. Priel, The Power of Form: The Shoah in Contemporary Hebrew Literature. Final Thoughts. Levine, Looking Back, Looking Ahead. Howard B. Levine works as a member of faculty at the Psychoanalytic Institute of New England East (PINE) and as a member of faculty and supervising analyst at Massachusetts Institute for Psychoanalysis (MIP). He is in private practice in Brookline, Massachusetts. Lawrence J. Brown is a supervising child analyst at the Boston Psychoanalytic Institute (BPSI). He is a member of faculty at the BPSI as well as at MIP, where he is a supervising analyst. He is the author of Intersubjective Processes and the Unconscious: An Integration of Freudian, Kleinian and Bionian Perspectives, published in 2011 by Routledge (New Library of Psychoanalysis). He is in private practice in Newton Centre, Massachusetts.